Friday was our final day in Bermuda, and although it was raining, we still had a great day! We began with our morning screening of SHELTER, presented by producer JD Disalvatore, and followed with an impromptu screening of CineSLAM Film Slam Seminar participant Cheryl Furjanic’s documentary SYNC OR SWIM. After our lunchtime break, we began again in Michael’s Lounge on board the Summit for our CineSLAM Film Slam Seminar/ Webisode panel discussion with Randall Jenson (50FAGGOTS), Sebastian La Cause (HUSTLING), and JC Calciano (STEAM ROOM STORIES). It was truly an exciting and educational discussion. Click the links above to see for yourself! Finally, we closed the day with our second official group dinner, sponsored by The Advocate! 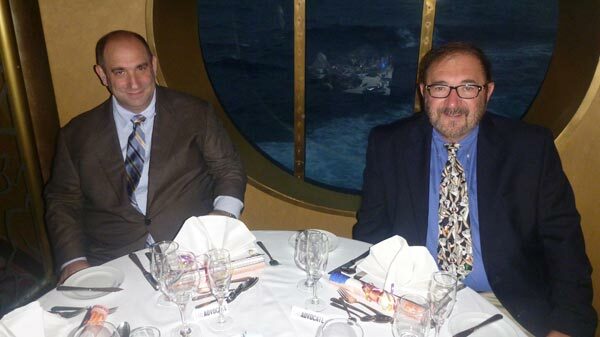 Our festival Cruise Director Jim Pollin (left) and festival Program Director John Scagliotti (right) at our second official group dinner, sponsored by The Advocate.